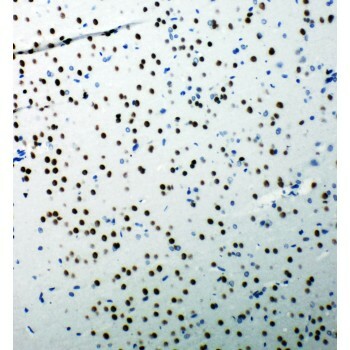 tumor protein p53 binding protein 1 Polyclonal IgG Rabbit Human, Mouse, Rat IHC-P, ICC, WB Immunogen affinity purified. 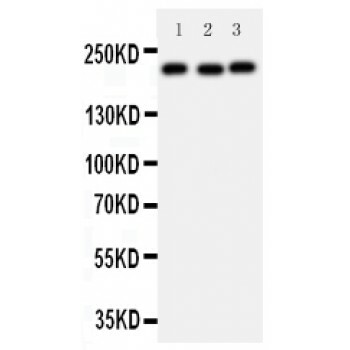 A synthetic peptide corresponding to a sequence at the C-terminus of human 53BP1(1955-1972aa ERIGFKQHPKYKHDYVSH), identical to the related mouse sequence. Nucleus. Chromosome, centromere, kinetochore. Note: Associated with kinetochores. 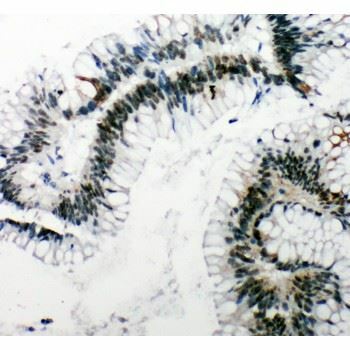 Both nuclear and cytoplasmic in some cells. Recruited to sites of DNA damage, such as double stand breaks. H4K20me2 is required for efficient localization to double strand breaks and removal of proteins that have a high affinity for H4K20me2 such as L3MBTL1 and KDM4A is needed.